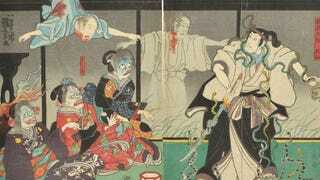 I love monsters of all sorts, but some of my favorites are the traditional monsters from Japanese folklore collectively referred to as yōkai. These creatures vary wildly in size and temperament from anthropomorphized household objects like karakasa—a lost umbrella with one eye and a long, floppy tongue that hops around looking for its owner—to the large and terrifying Gashadokuro, gigantic skeletons that wander battlefields and other areas where corpses have been left to rot without proper burials, snatching up and biting the heads off of unwary travelers just for fun. If you want to look deeper into this endlessly fascinating (and frequently delightful) animistic tradition, the online yokai database is fun to click around, and there are several books on the subject in English, like PIE International’s Yokai Museum and Yokai Wonderland, collections of yokai-inspired art from the Edo period through the present day from Koichi Yumoto, Japan’s premier collector of yokai art. On the fictional front, manga artist Shigeru Mizuki, who died in 2015, made a career of interpreting traditional monsters for a modern audience; his most famous creation, GeGeGe No Kitarō, has inspired countless comics, six different anime adaptations, and a series of live-action films. Personally, I like the live-action Yokai Monsters movie series from the late ’60s, whose kitschy creature design should hit the sweet spot for fans of Sid and Marty Krofft.